Robin Crockett and Marcus Crockett. Death record, newspaper obituary, military records. "Texas Death Certificates 1903–1982", digital image, Ancestry.com, "Sackett, Fred, d. Overall Mem. Hospital, Coleman, Coleman County, Texas, 15 Nov 1957, age 68-6-1, b. Coleman County, 14 May 1889, res. 512 Martin St, Coleman, married, airport attendant, served WW1, father Henry Sackett b. England, mother Mary McNamara b. Kansas, informant Fred Sackett, cause myocardial insufficiency, diabetes, bur. Coleman, 16 Nov 1957." 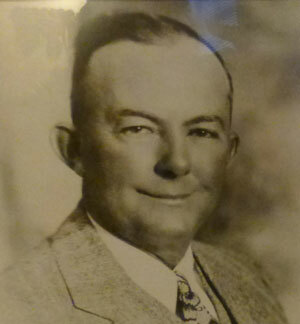 Coleman Democrat-Voice (Texas), digital image, Find A Grave (www.findagrave.com), obituary. US Social Security Administration, "Social Security Death Index", database, American Ancestors, "Fred Sackett, b., d. Nov, 1957, SSN 462-26-7213 issued TX, residence unknown." "US, Headstone Applications for Military Veterans, 1925–1963", digital image, Ancestry.com, "Sackett, Fred, enlisted 27 Apr 1918, discharged 3 Feb 1919 Hon, service no 2808412, pension claim none, Texas, Pvt, medals Purple Heart with Oak Leaf Cluster, Co.E.360 Inf.-90 Div, b. 14 May 1889, d. 15 Nov 1957, emblem: Christian (Latin Cross), flat granite marker, ship to J E Stevens Co, Coleman, Texas, Coleman City Cemetery, applicant Mrs Fred Sackett, 512 Martin, Coleman, Texas, 27 Dec 1957." MacNamara, Annie, sister, b. Apr 1862, 38, single, b. UT, father b. Ireland, mother b. WI. Sackett, Nellie, dau, 13, b. TX, father b. England, mother b. KS. "US, World War I draft registrations records 1917–1918", digital image, FamilySearch, Texas, Coleman. 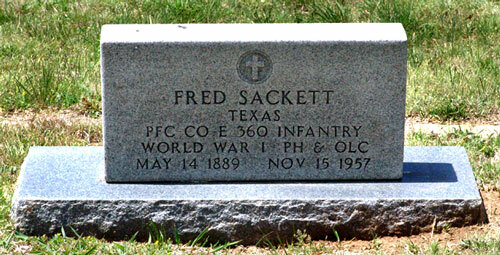 "Fred Sackett, age 28. Home address: Burdett [prob. Burkett? ], Coleman Co., Texas. Natural-born citizen, b. Camp Colorado, Texas, 14 May 1889. Occupation: Stockman. Single; no dependents listed. Race: Caucasian. No previous military service; no draft exemption claimed. Signed: Fred Sackett. Medium height, medium build, gray eyes, dark brown hair; no disabilities. Registrar is a Henry Sackett, Precinct 10, Coleman Co., Texas, 5 Jun 1917." Sackett, Sidney, gson, 10, b. TX, father b. TX, mother b. TX. "US World War II draft registration cards, 1942", digital image, FamilySearch, "Serial U2033, Fred Sackett, 512 Martin St, Coleman, Coleman County, Texas, age 52, b. Camp Colorado, Texas, 14 May 1889, contact Mrs Fay Sackett, 512 Martin St, employer Coleman Flying School Ltd, Coleman, Texas, race white, ht 5' 10", wt 165, eyes gray, complexion ruddy, gun shot in left arm. Reg Coleman, Texas, 27 Apr 1942."